PRIOR to PRESS A PRE-PRESS GUIDE TO COMPUTER-TO-SCREEN M A R K E V A N S 5 6 P R I N T W E A R M A R C H 2 0 1 9 I magine this scenario. You are the se- nior designer in a busy screen print- ing operation, and your boss just in- formed you that they have purchased a computer-to-screen (CTS) system to speed up screen production and im- prove image stencil quality. What does this mean for you and your team? At first glance, there is nothing to worry about. You will still need to prepare the artwork designs as normal. The only differ- ence is that you are printing directly on the emulsion coated screen instead of output- ting a film positive, right? Wrong! By its very nature, CTS means that the image positioning on a screen is now being done digitally rather than mechanically. There is no longer a piece of film being cut to size and taped on the screen. This process is now electronic, and it becomes part of the digital pre-press workflow. This is the same issue that faced litho printers a decade or more ago when they transi- tioned from film imagesetters to comput- er-to-plate systems. Another big change is that instead of a film printer or imagesetter in the art room area, the CTS system needs to be in a UV light-safe environment, typically inside the screen room, which probably puts it out of reach of the artists and designers who are normally responsible for producing film positives. So, what does this mean for the pre- press workflow? What job responsibilities change and how? You have been told that the CTS system is a labor-saving device, but how exactly are these savings achieved? If your company is already running a direct-to-garment (D2) system, then you will have some familiarity with how the process will change. With D2 printing, the artwork placement is usually controlled by pre-defined software templates that have pre-set sizes and positions for the artwork. So, one template might be an all-over front print, and another might be a left (or right) chest pocket print. Additional templates may also be required for differ- ent shirt sizes such as baby/toddler, child, adult, etc. Working with software templates may seem like more work for the design depart- ment, but it really doesn't have to be. In fact, the auto registration of color separa- tions that comes with CTS means that you can make full use of design applications and/or your RIP software's ability to auto- separate jobs. Often with film product, these separations are performed manually by the designer to save on film output wast- age. But once you are using CTS, this step is no longer necessary. 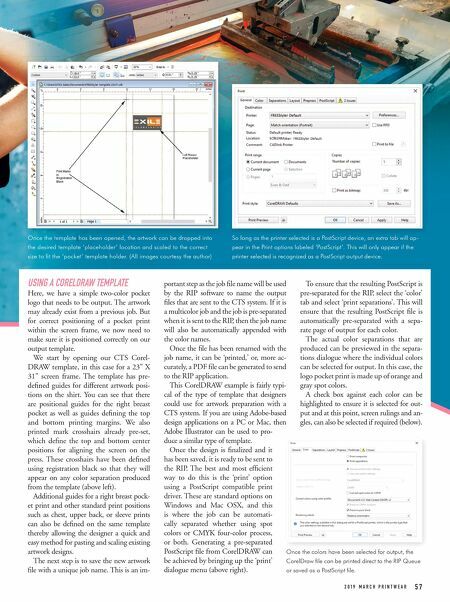 If your workflow is set up correctly by your CTS supplier, you should be able to simply place your artwork in a predefined illustrator or CorelDRAW template and hit the 'print' button. The ap- plication and RIP software should take care of the rest. If it doesn't, then maybe you bought the wrong system. So, let's look at a typical CTS pre-press workflow. In the following example, we are using CorelDRAW to make our T-shirt de- signs.